Out of all the online dating sites available, only a select few honestly know how to get people together. How do they do this? The answer is: Online dating tests. You may be thinking that compatibility tests on some of the dating sites are just a series of long-winded questions and random answers. But that is not the case. In fact, compatibility tests are shown to be more effective than dating alone. People don’t know what they want, and so they go into online dating blindly. People who date online without using compatibility tests provided by the best dating sites, date people they don’t click with, and are often let down by the outcome of the date. Online dating tests provided by sites such as eHarmony, Zoosk, and Match.com, take pride in their compatibility tests and invest in research to provide only the best online dating personality tests for their members. Still not convinced? Take a look at the data we have provided for you below. No online dating sites are created equally, therefore all dating compatibility algorithms differ. But, that does not make them any less effective. For instance, eHarmony’s compatibility test is comprised of 258 questions, which you must take carefully and provide thoughtful responses to be effective. Zoosk’s algorithm is behavior-based, meaning that you will find matches based on particular behaviors of yourself. Match.com, one of the largest online dating services, created Chemistry.com to design an algorithm for their matchmaking service. It works by bringing you together with other individuals who share your personality traits. How successful are the compatibility tests of major online dating sites? The truth is, quite successful. The online dating compatibility test for eHarmony, recorded by a national Harris survey, found that two percent of marriages two percent of marriages and over 120 weddings were performed in the United States occurred due to eHarmony’s compatibility services. Zoosk, the popular online dating site that began as a Facebook app, implemented their Behavioral MatchmakingTM system in 2010. Since then, it has been responsible for over 700 million couple matches, and the numbers continue to grow. Match.com has seen similar success with their personality-based algorithm, which is responsible for nearly 4,000 dates made weekly. Some couples even stated that they were successfully matched using the compatibility algorithm without ever viewing their profiles—and got married! What type of questions are seen on compatibility tests? Questions on dating tests quizzes can vary, but the more unique the question, the better and original your answer is likely to be. Some eHarmony ‘vital traits’ example questions include “how well you communicate with other people," and “how well do you resolve conflict?" Zoosk’s compatibility questionnaire revolves about questions such as “Your opinion about work," and, “Do you have career goals?" 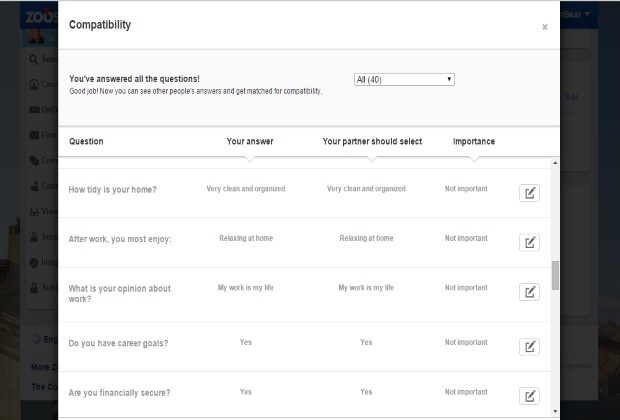 With Match.com’s personality test, you’re asked a series of questions with images referencing commonly known personality factors in most men and women. Based on your responses, your personality builds as you progress. And, when you finish the quiz, you’ll be introduced to five of your best matches based on your personality compatibility results. What is the future of compatibility tests? While 29 core social and emotional traits, vital attributes, and behavioral matchmaking systems are effective and have been successful, personality-based systems are seen as the potential future for successful online dating. The reason is that personality tends to connect people based on similar interests. Match.com’s personality-based test, created by Dr. Helen Fisher, utilizes strong aspects of personality to make better pairing on the popular dating site. Personality traits are unique to each individual, which makes matchmaking all that more fun and interesting. Ready to take one of the most well-known online dating compatibility tests? Check out eHarmony and get ready for real matches today.